Financially struggling NYC Health + Hospitals pushes back its Epic project “a few months” with just two of 11 hospitals live. A health system spokesperson refused to answer a reporter’s question about its original project deadlines and budget and completion estimates. NYCHHC’s annual budget deficit is running at $800 million and is expected to swell to a nearly $2 billion annual shortfall by 2020. From Phinneas: “Re: Aventura. Shut its doors Wednesday with no employee severance.” Not true, the company says, although they did make some changes that they will describe in more detail later. From Caughtinatrap: “Re: Curaspan, now Navihealth. Layoffs in Newton, MA with at least four executives let go.” Unverified. I couldn’t find a cached copy of the executive page to compare. From Six Degrees of Wayne: “Re: Epic. Lars-Oluf Nielsen (who HIStalk had published a couple years ago left Epic to become CEO of iMDsoft) recently returned to Epic without much advance notice to lead the Implementation Division. Tina Perkins is apparently out of that role without much warning. Lots of drama. A quick check of the news seems to show that iMDsoft was acquired by another company not long after Lars started there. Sounds like an interesting dodge, and probably an even more interesting payday for the House of Nielsen.” IMDsoft was acquired by Harris Computer in December 2016, while the LinkedIn of Lars shows he left in November 2016 and rejoined Epic in January 2017 as SVP/chief implementation officer. Optimum Healthcare IT is a leading healthcare IT staffing and consulting services company based in Jacksonville Beach, FL. Recently named the Best in KLAS Overall IT Services Firm, Optimum Healthcare IT provides world-class consulting services in advisory, implementation, training and activation, Community Connect, analytics, security, and managed services – supporting our client’s needs through the continuum of care. Our excellence in service is driven by a leadership team with more than 100 years of experience in providing expert healthcare staffing and consulting solutions to all types of organizations. At Optimum Healthcare IT, we are committed to helping our clients improve healthcare delivery. By bringing the most proficient and experienced consultants in the industry together to identify our clients’ issues, we work to explore the right solutions to fit their organization’s goals. Together, we identify and implement the best people, processes, and technology to ensure our client’s success. By listening, we understand our clients’ unique needs and then select only the most qualified candidates for your organization – and then we constantly follow-up to make sure the consultants remain a perfect fit. Our team brings years of healthcare clinical, operational, and IT knowledge and takes the time to understand the uniqueness of your organization, working collaboratively with your staff to customize solutions that are specific and targeted to your needs. Without sacrificing quality, we are committed to providing world-class consulting services, at a reasonable cost. Our role is to act as trusted advisors to our clients – your success is our success. 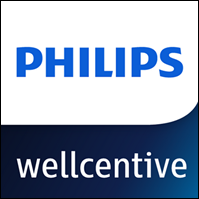 Since 2005, Philips Wellcentive has driven quality improvement, revenue growth and business transformation for providers, health systems, employers, and payers transitioning to value-based care. Our highly scalable, cloud-based, and value-driven population health management solution provides long-term partnership services to impact clinical, financial, and human outcomes. Recognized as a leader in population health management in reports by IDC Health, KLAS, and Chilmark, Philips Wellcentive helps customers provide care management for more than 30 million patients and achieve more than $500 million annually in value-based revenue. 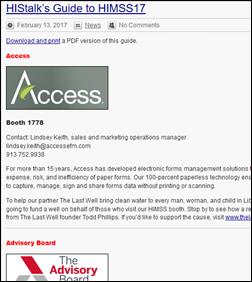 Stop by booth 2105 at HIMSS; visit www.wellcentive.com; and follow us on Twitter, LinkedIn and Facebook. Validic provides the industry’s leading digital health platform connecting providers, pharmaceutical companies, payers, wellness companies, and healthcare IT vendors to health data gathered from hundreds of in-home clinical devices, wearables, and consumer healthcare applications. Reaching more than 223 million lives in 47 countries, its scalable, cloud-based solution offers one connection to a continuously-expanding ecosystem of consumer and clinical health data, delivering the standardized and actionable insight needed to drive better health outcomes and power improved population health, care coordination, and patient engagement initiatives. To learn more visit www.validic.com, connect with us on Twitter @Validic, or stop by Booth #7281-33 at HIMSS. 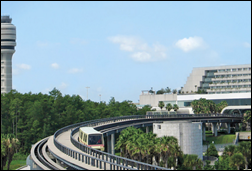 Versus not only provides a multi-platform, scalable approach to RTLS, we have the software solutions, expert consulting and implementation services to ensure your project’s success. We are your partner for process improvement. Visit booth 1723 for a live demonstration of how we combine our KLAS-leading location accuracy with your existing Wi-Fi locating for enterprise visibility into your operations. And, see how our analytics drive process improvements that ultimately increase access and enhance the patient experience. Clearsense is a data science company that offers a cloud-based analytics solution that works with any data source and can be rolled out in a fraction of the time required for a traditional data warehouse. Its real-time, cloud-based, subscription-priced, scalable system helps healthcare organizations respond to the pressure to use data to make better and faster decisions. Examples: reducing adverse events, improving patient flow, hitting quality and patient satisfaction targets, driving research, and managing cost and payment. I traveled to Orlando today. The airport was mobbed (only one shuttle is running between the terminal and gates as the other is being replaced in a months-long project) and baggage claim was a bit of a mess, but otherwise the weather is good and the condo I rented via VRBO is fabulous, maybe 1,500 square feet overlooking a lake with everything you could possible want (including a pool table) for far less money than a hotel. It’s supposedly within a half-mile or so walk to the convention center, although I got in late and haven’t ventured out yet. No offense to my fellow HIMSS attendees, but I’m happy to be able to escape the maelstrom, pop open a beer from the refrigerator after a long day, and either make an easy dinner or have it delivered without queueing up at the tourist trap restaurants where all the other badge-wearers expensively and loudly graze. Life is too short to start the day waiting in a breakfast or coffee line that’s moving slower than the new LinkedIn user interface. I haven’t even looked at the conference schedule yet, so I guess that’s on the agenda sometime in the next day or two. I have scheduled no appointments, made no commitments to visit particular booths, or done anything else that would impede my ability to – like a child – wander around stopping to look at whatever catches my eye. On my must-do list, though, is the triumphant return of the world-class scones baked on site by MedData that I noticed in my HIMSS guide, truly the best giveaway I have ever witnessed (and eaten). It’s always a toss-up among their rotating flavors – is passion fruit better than orange? I shall be happy to weigh the evidence and report. With the HIMSS conference, I’ll be skipping the usual news format and will instead tell you what I’m seeing and hearing, ignoring all but the most significant vendor announcements (which is probably 1 percent of them, the remainder just being a pointless PR stake in the ground). 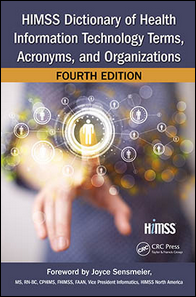 You can read or download/print my HIMSS guide, which tells you what my sponsors will be doing, including presentations, swell giveaways, and fun social events. This week on HIStalk Practice: Metropolitan Center for Mental Health replaces paper with TenEleven Group tech. New York physicians begin to see the benefits of e-prescribing. CareSync prepares to launch new CPC+ protocols. 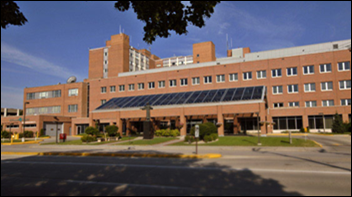 Furhmann Health Center implements InboundMD. Answer Health on Demand joins Great Lakes Health Connect. Mental Health Center of Denver selects RxRevu e-prescribing software. Liberty HealthShare rolls out Salus Telehealth. Allscripts announces Q4 results: revenue up 23 percent, adjusted EPS $0.14 vs. $0.13, beating revenue expectations but falling short on earnings. Shares dropped slightly in after-hours trading Thursday following the announcement. The company said in the earnings call that it sold one domestic Sunrise account in the quarter and another two in the UK. It has doubled annual bookings since the current executive team joined the company in 2012 even as the market changed from selling regulatory compliance to selling ROI. Market research firm Peer60 renames itself to Reaction, saying the old name was too confusing. I’ve seen “Peer360” countless times, so I get it. Plus it’s one fewer “small first letter” company to conform to my HIStalk journalistic style sheet that requires a capital first letter (except when I forget). I like Reaction, although Peer60 would provide more fruitful Google searches. MIT and Harvard’s Broad Institute wins its patent battle over CRISPR genome editing technology, likely the most valuable biotechnology patent ever filed. 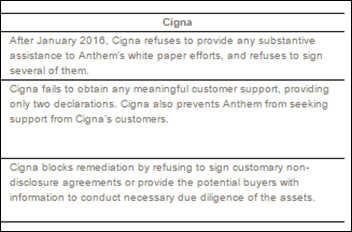 After Cigna terminates its planned merger with Anthem and instead sues Anthem for nearly $15 billion, Anthem responds by filing its own lawsuit seeking a restraining order to prevent Cigna from terminating the merger. 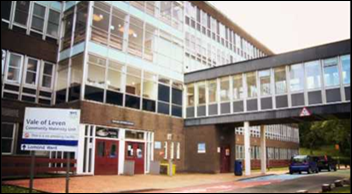 NHS National Services Scotland signs a multi-year contract with NextGate to replace its Community Health Index with a more up-to-date EMPI solution. Hospital Sisters Health System (IL) signs a three-year contract with LogicStream Health for its clinical process measurement tools. Maine’s HealthInfoNet HIE selects Orion Health’s Amadeus precision medicine and analytics software. 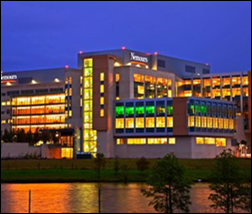 Nemours Children’s Health System (FL) integrates e-prescribing software for controlled substances from HID Global with Epic. 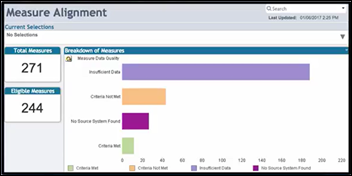 Health Catalyst develops the MACRA Measures & Insights resource application to help providers track and measure MACRA measures across the enterprise. MCG Health will share its care guidelines and analytics with payers and providers via the InterSystems HealthShare data-sharing tool. Harvard Pilgrim Health Care (MA) rolls out Data Diagnostics analytics software from Quest Diagnostics and Inovalon. Aprima, EClinicalWorks, and NextGen Healthcare join the Surescripts National Record Locator Service. CMS publishes a proposed rule aimed at stabilizing the individual and small group markets that would cut the open enrollment period in half. Meanwhile, House Republican leaders and new HHS Secretary Tom Price provide some details about their proposed ACA replacement that includes replacing subsidies with tax credits, reducing payments by 50 percent to the 31 states that expanded Medicaid to eliminate an open-ended federal entitlement in favor of a fixed grant, and encouraging insurance sales across state lines. They did not offer a side-by-side comparison, a breakdown of costs, or the number of ACA-insured people they estimate will continue to have coverage. Here is my bellwether – an HSA is not insurance, and neither is any plan whose maximum payout is capped. You buy insurance to prevent catastrophes, so I think by definition any plan that allows or requires someone to file bankruptcy because their insurance has been exhausted after receiving medically necessary care isn’t really insurance – it’s just premium payment assistance. A federal appeals court strikes down a Florida law that prohibits doctors from asking patients if they own guns. Doctors opposed the law in considering gun safety questions an important part of public health screening. The court preserved one part of the law that bars doctors from discriminating against gun-owning patients. CloudWave adds managed backup and security services to its OpSus Healthcare Cloud service line. Epic will add care management technology from XG Health Solutions to its Healthy Planet population health management software later this year. CommonWell wraps up integration of The Argonaut Project’s latest FHIR specifications with its data-exchange services, giving members the ability to use FHIR-based capabilities when accessing data across the network. 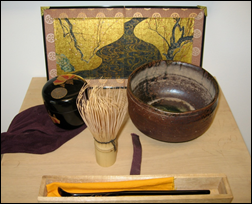 Japanese tea ceremony aficionado John Halamka will conduct “The Way of Tea” Monday from 3:00 until 4:00 in the Vital Images booth. It’s cool that Vital is honoring the Japanese roots of parent company Toshiba Medical in presenting a ritual that includes “a series of precise hand movements and graceful choreography, in a serene ‘Tatami Room’ within the Vital exhibit on the conference floor.” John will speak about Japanese culture and health IT afterward. 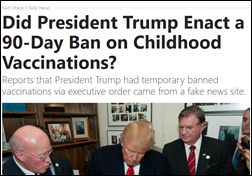 Interesting: 20th Century Fox created fake news sites to promote its new drama about a wellness spa that offers a phony disease cure, creating sites such as the “Indianapolis Gazette,” “NY Morning Post,” and even “HealthCureGov.com” that offered clickbait fake stories such as “Utah Senator Introduces Bill to Jail, Publicly Shame Women Who Receive Abortions” and “BOMBSHELL: Trump and Putin Spotted at Swiss Resort Prior to Election.” Other stories claimed that the new administration had banned MMR vaccine and that the AMA had recognized that a third of the country is suffering from “Trump depression disorder,” intentionally phony and sensationalistic stories that were dutifully repeated on Facebook by clueless dolts and hyper-partisan groups (was that redundant?). The Technology Association of Georgia includes Ingenious Med in its list of the Top 40 Most Innovative Technology Companies in Georgia. LogicStream Health releases version 6.0 of its Clinical Process Measurement platform. Orion Health announces that its Rhapsody Integration Engine is now in use at more than 640 healthcare organizations in 36 countries. Gartner includes PerfectServe in its Market Guide for Clinical Communication and Collaboration. Lexmark wins the healthcare market leadership award from Buyers Lab. Or, maybe Lars got the iMDSoft company to a profitable point where the owners wanted to sell it and Lars decided it was a good time to exit and rejoin Epic. Lars was welcomed back and Tina is still a key exec of the highest level in Epic. Re: ACA replacement cost comparison: Might be hard to find. As noted by HIS Talk (1/20/17), House rules implemented on January 3, 2017 specifically prohibit CBO from talking about the effects of ACA changes. I don’t think him being there >2 months is going to make a huge change in their bottom line and them suddenly selling it. It takes a lot longer than that for that to occur. He probably joined, it got acquired and he didn’t like it, so he left. There’s a lot of assumption and probability in this comment. If you don’t have information pertinent to the above comment, why waste words? Lars was at the other company for 2 years, not 2 months. It’s editorial opinions and quips like this that keep me coming back every(week)day to HISTalk! Point of clarification. As we, Chilmark Research, have never published a PHM rpt ranking vendors, we have no opinion on the capabilities of Philips Wellcentive vs any other purported PHM vendor. Only in the last 6-10 months have vendor solutions approached some modest level of functionality to support a healthcare org’s PHM strategy. We are planning to do a PHM rpt later this year, then we shall see who is delivering the goods and who is just addressing some modest piece of the PHM pie.